LEC #42 of 1500. LEC exclusive. 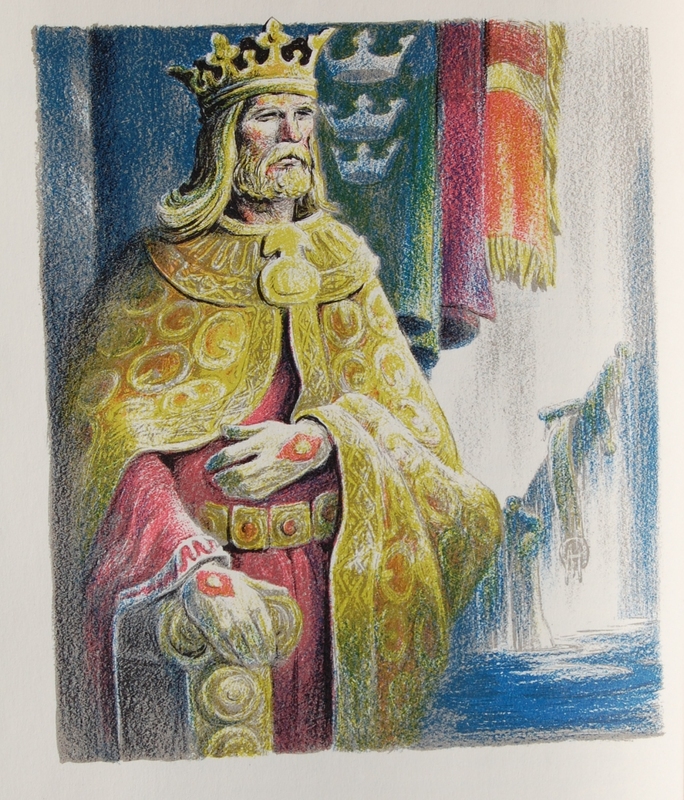 A Heritage exclusive version of this work, featuring Robert Ball’s illustrations, was issued in 1939. 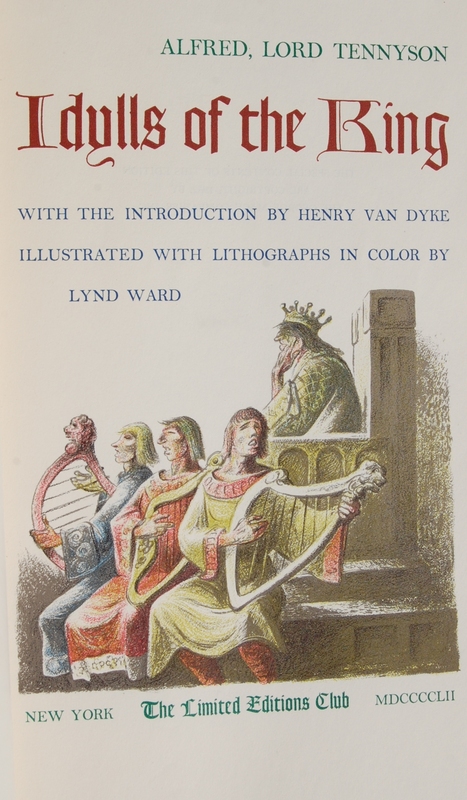 Front Binding – Our latest LEC is the lovely 1952 offering Idylls of the King, by the lauded poet Alfred, Lord Tennyson. 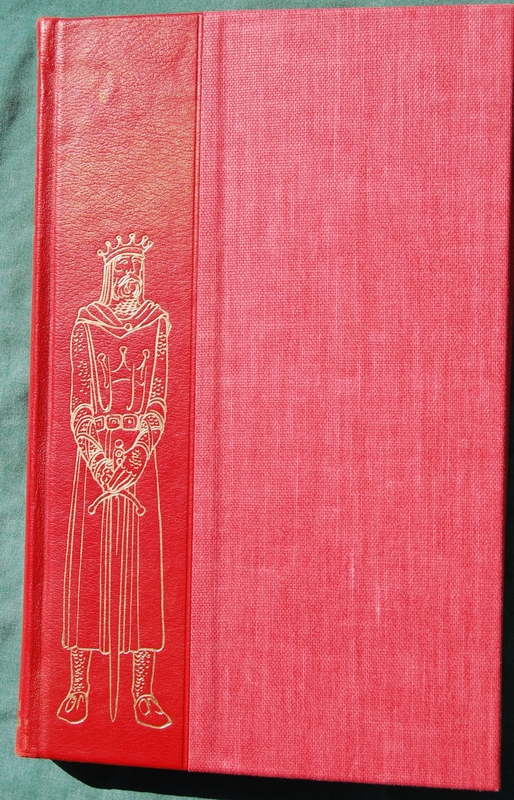 However, this was not the first time Macy published this loving epic to the heroics of King Arthur and the Round Table; in 1939, the Heritage Press issued their own edition starring the artistic talents of Robert Ball. If you don’t mind, I’d like to take a slight tangent, as Ball is a bit of curiosity in the Macy canon. He was called upon to do more Heritage exclusives (Idylls, The Compleat Angler and Bleak House) than he was for LECs (Waverly), which is unusual. But let’s return to the book in question (I can go into Ball’s career more when I get a book featuring him). The LEC Idylls was the first Tennyson outing for the Club; Cardevon Press would issue his Poems in 1974 with Reynolds Stone providing the art. And that is that for Tennyson; three books isn’t shabby, but perhaps a little skimpy for one of Britain’s more famous poetic figures. Someone who was not a stranger to the LEC (and is not at all skimpy in their output!) is the talented Lynd Ward, whose work has been frequently covered here on the blog already. It has been some time, though; Les Miserables was the last post starring Mr. Ward, and that was in 2012! That post just so happens to cover his bibliography with the two presses as well. Ward is easily one of my favorite illustrators, and this book furthers my commitment that he was among the finest artists of the 20th century, if not in human history (alongside Fritz Eichenberg). For this book, as with The Innocent Voyage, Ward utilized color lithographs, and the process is once again astounding in its execution. Six months of work generated forty eight lithographs, with each color representing its own unique plate per illustration. Since most of these lithographs are at least five colors, that is a herculean two hundred and forty individual plates Ward created, and then he magically put together correctly to form the beautiful illustrations in this book. If one plate was out of order, then the entire illustration was botched! It’s almost unbelievable to fathom the dedication and care Ward utilized for these complex art pieces. With the author and illustrator covered, let’s focus in on this lovely book’s production details. Carl Purlington Rollins came out of retirement to design this volume for the LEC, and the letter has a fairly rich biography of his career on Page 4. His touch can be seen earlier here for the Heritage Walden and the Heritage Crime and Punishment. 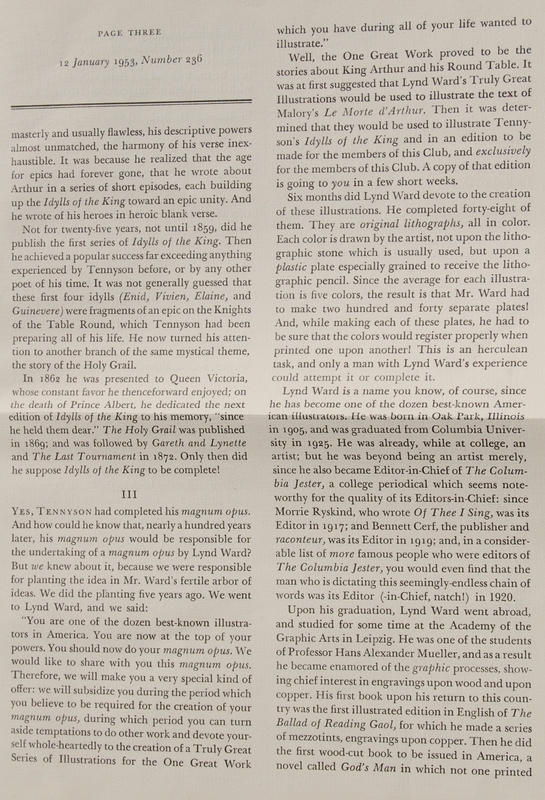 Yale University’s printing office handled the printing of the text on a special Curtis paper specifically made for the LEC called Colophon Text. The font is indirectly stated to be of the Baskerville family, with the text initials coming from the Goudy family. 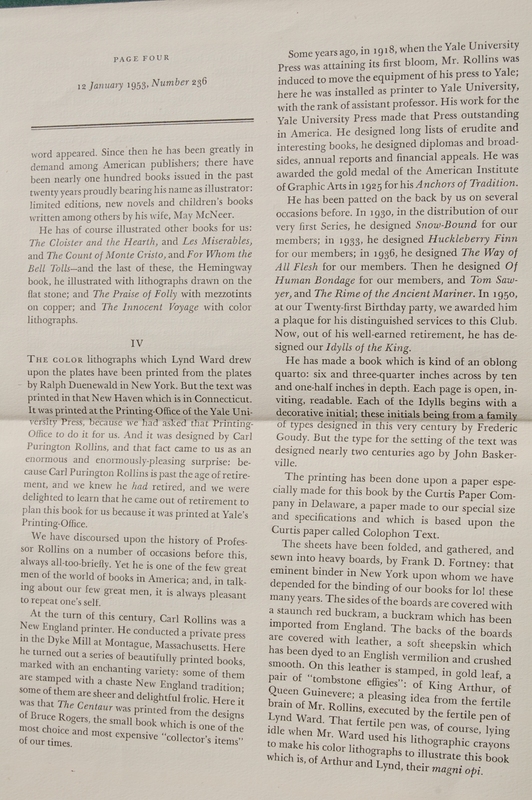 Russell Rutter was the bindery. Ward’s lively lithographs were printed by the Duenewald Printing Corporation. Red buckram is the primary cloth for the boards, with a sheepskin leather for the spine. 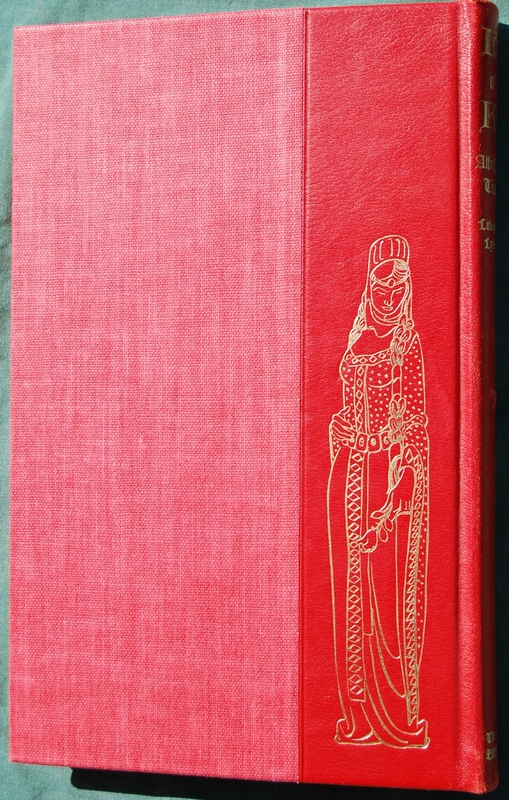 The vermilion spine features excellent renderings of Arthur and Guinevere on each side done by Ward and stamped in with gold leaf, which also is featured in the classy spine text. Macy notes that this is the “magni opi” of Tennyson and Lynd Ward; I’ll let you be the judge. I’m not too sure Macy’s far off in his assessment! Title Page – Henry Van Dyke was called upon to introduce the book. The Heritage version, meanwhile, lacks any formal introduction (thanks to Django6924 for checking his copy for me). Anyway, isn’t this a lovely title page? This may be one of my all-time favorites of the Macy canon. 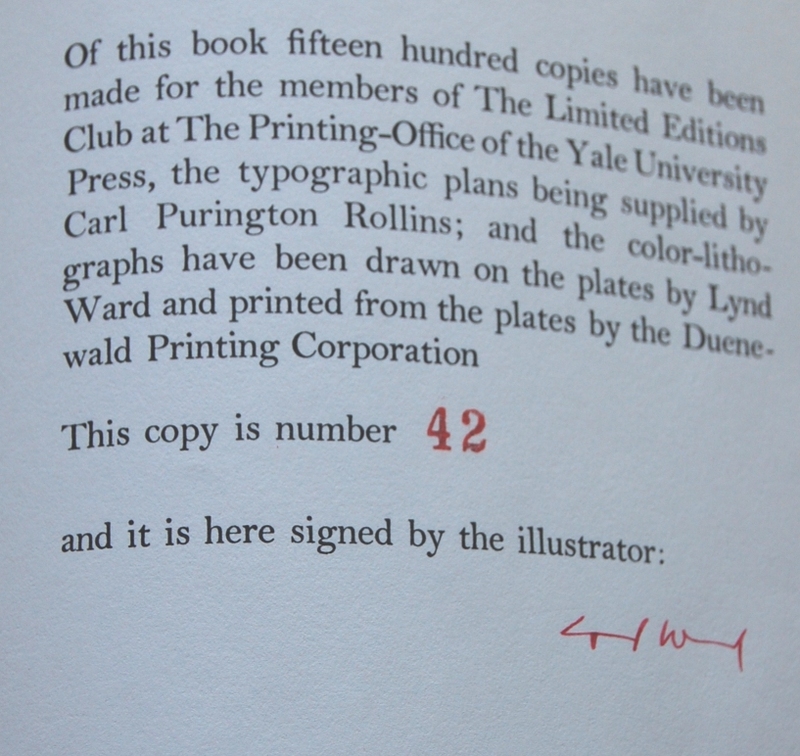 Colophon – Ward signed the work, and you can see that this is #42. I think this is the “youngest” book I have in terms of rank. 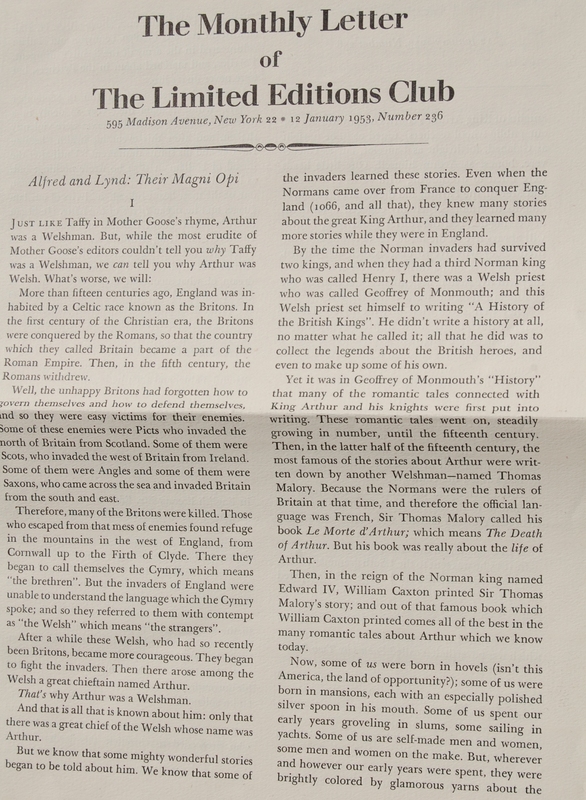 Page vii – Most of the artwork in the book consists of page headers like this. Still lovely. Page 2 – Ward is simply stunning here. Lovely colors. This too was a bit of a calculated risk, like Fathers and Sons. I ordered it off of ABEBooks for the low price of $20 (plus shipping), and all and all I’m very happy with it. There is a former owner’s inscription in it, but beyond that it was on par with all of my other LECs, and I’m thankful I took the chance on it! It’s nice to have a second signed Ward in my collection, and it’s a doozy, too! 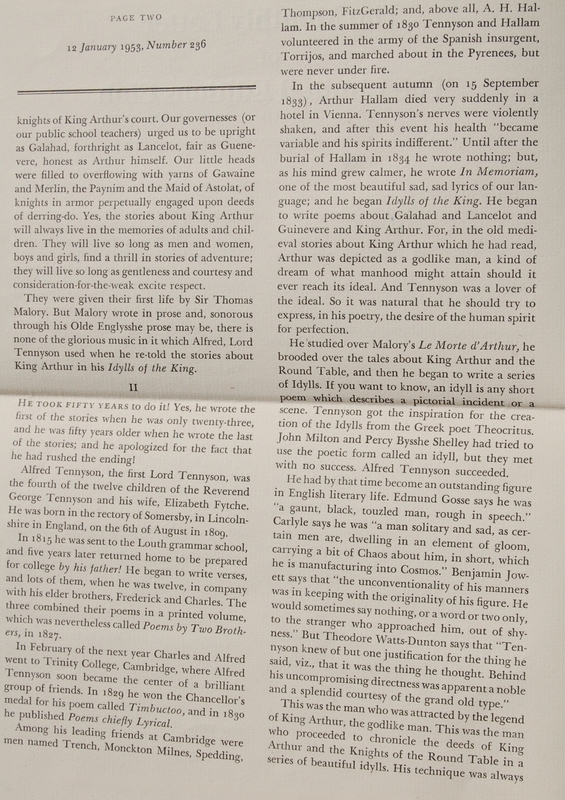 1 – The page edge on the left kind of cuts off, but I think the text is still legible enough to keep it for now. I’ll retake the shot in the near future. 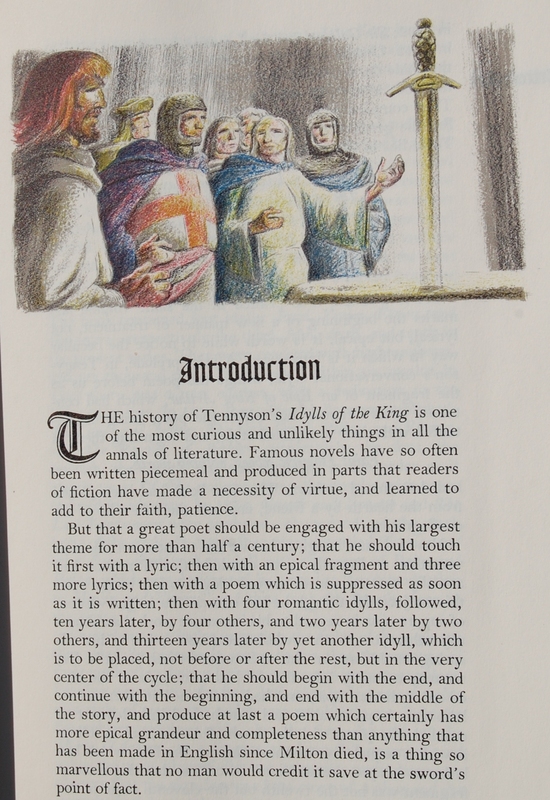 You are currently reading Limited Editions Club: Idylls of the King by Alfred, Lord Tennyson (1952) at The George Macy Imagery.